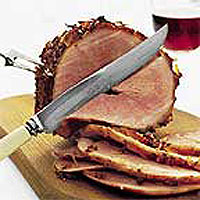 Add a traditional baked gammon to your Christmas table. Serve any leftovers warm or cold in sandwiches, or with bubble and squeak for a Boxing Day brunch. There is no need to soak the meat before baking - it is ready to cook. Preheat the oven to 180°C, gas mark 4. Place the gammon in a roasting tin and cover loosely with foil. Cook for 2 hours. Meanwhile, pare the zest from the clementine, taking care not to include too much white pith. Cut the zest into thin strips. Place in a small pan and cover with cold water. Bring to the boil, then simmer for 15 minutes until the zest is tender. Drain. Thinly slice the ginger, then cut the slices into thin strips. Mix the ginger strips with the clementine zest, ginger syrup and mustard seeds in a bowl. Remove the gammon from the oven. Using a sharp knife, remove the string, cut off and discard the skin, and score a crisscross pattern in the fat. Insert 2 long metal skewers into the joint to hold it tightly in place. Spread the clementine mixture over the gammon and pour 150ml boiling water into the roasting tin (this prevents the glaze burning onto the tin). Return the gammon to the oven, uncovered, for 40 minutes until the glaze is browned and sticky. Remove the skewers from the joint and serve it warm or cold. Use a vegetable peeler to remove the clementine zest and scrape the pith with a small, sharp knife. Note: Wash hands, equipment and work surfaces thoroughly after handling raw meat. This recipe was first published in December 2003.